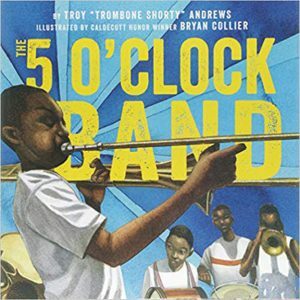 Troy “Trombone Shorty” Andrews’ love of music, New Orleans and the Treme neighborhood where he was nurtured, plus his sweet nature, sing out in these two books. The vibrant and brilliantly colorful illustrations by award-winning Bryan Collier bring Shorty’s words to life as he tells the story of his childhood as an aspiring musician. 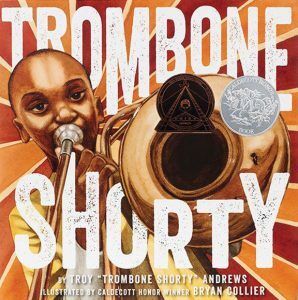 It’s obvious from his many accomplishments, warm demeanor and the establishment of his youth-oriented Trombone Shorty Foundation that Andrews took to heart the lessons he speaks of in both of these books. They stand as a lullaby to dreamland for youngsters who have fantasies and big ideas of their own. 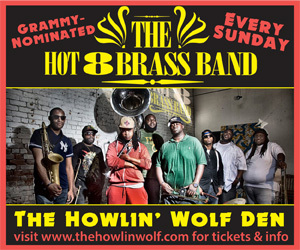 As a very young Trombone Shorty said to the towering figure of the great Bo Diddley when the guitarist asked him, “What do you want to play?” “Follow me” was his reply.